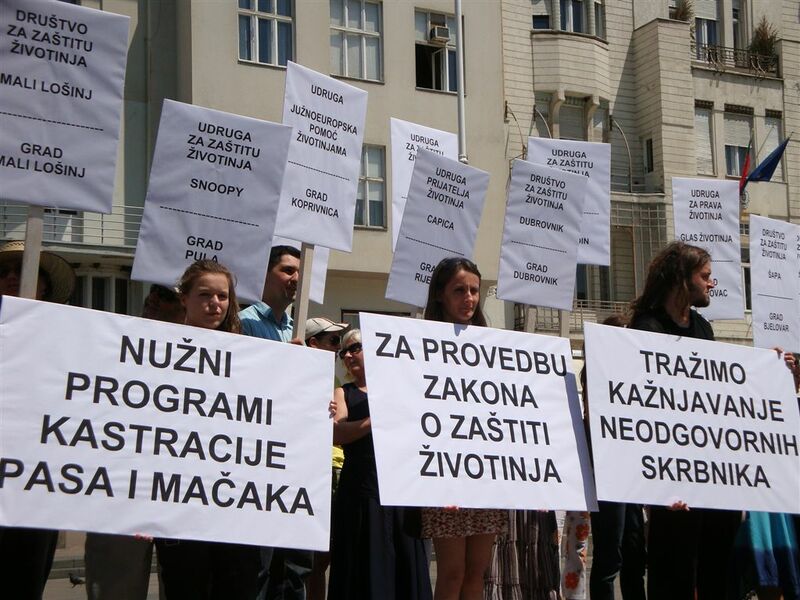 Urged by by the shocking state all over Croatia, where legal obligation is left to the care of groups of volunteers and citizens, the shocking state of existing shelters and lack of new ones, Animal Friends organizes a protest to show up the not implementing of the Animal Protection Act. 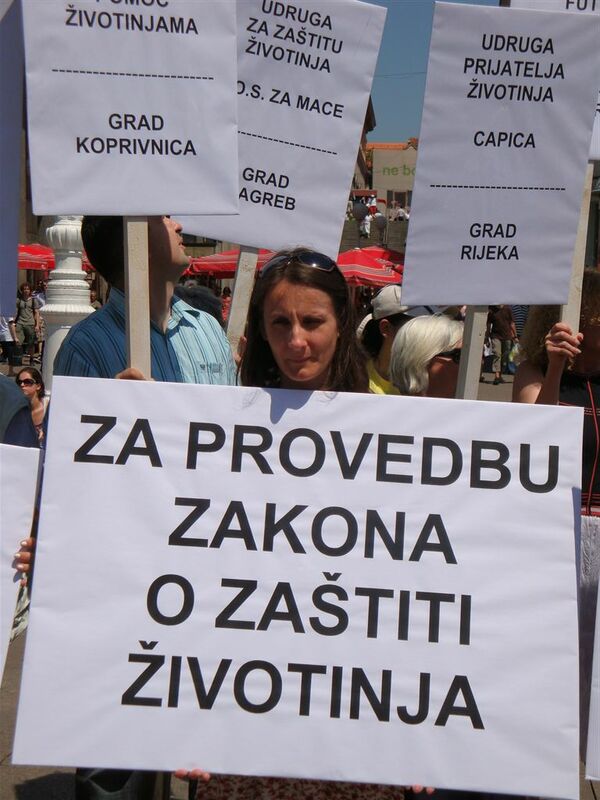 The protest will be held on Saturday, July 12, 2008, at 12 noon on Ban Jelacic Square in Zagreb. On this protest will gather more than 20 animal protection groups from Bjelovar, Cakovec, Dubrovnik, Karlovac, Koprivnica, Lovran, Mali Losinj, Pula, Rijeka, Sesvete, Slavonski Brod, Split, Umag, Varazdin, Vinkovci, Virovitica, Zadar, Zagreb, and Zapresic. The new Animal Protection Act has come into force on January 1, 2007, but although it has existed for almost 2 years now, it still hasn't become effective. Overpopulated abandoned animals due to irresponsible guardians towards the new law became the responsibility of the counties, that is local districts and their cities, whilst inertness of local communities regarding fulfilling legal obligations and insufficient collaboration with associations make this problem even bigger. A huge problem of abandoned animals is characteristically for both urban environments and smaller communities. Animal shelters regulated by the law are missing all over the country and with them the appropriate veterinary care, spay/neuter programs, homing of animals and penalization of irresponsible citizens. Penalization of irresponsible individuals who abandon/abuse animals. It is the legal and especially moral obligation of the local communities to take responsibility as soon as possible in order to solve the problem of abandoned animals, which end up on the street because of the irresponsibility of its citizens. Abandoned animals are not the problem of the so-called "animal lovers" and relevant organizations, but rather an issue for which all citizens are responsible. Therefore, it is the municipal administration that should address this problem by systematically introducing a program of sheltering, spay/neuter, homing, and education, as well as the legal prosecution of irresponsible guardians. They should by no means allow those to suffer who have not created the problem in the first place: the animals themselves. The ever-present problem of animal abandoning and abuse and also not sanctioning of the persons responsible should be enough of a warning to responsible authorities that it is about time for a consistent implementation of the Croatian Animal Protection Act.